This week I acquired this beautiful hand-crafted Torah ark for my congregation, Tabernacle of David. I think it's beautiful, don't you? 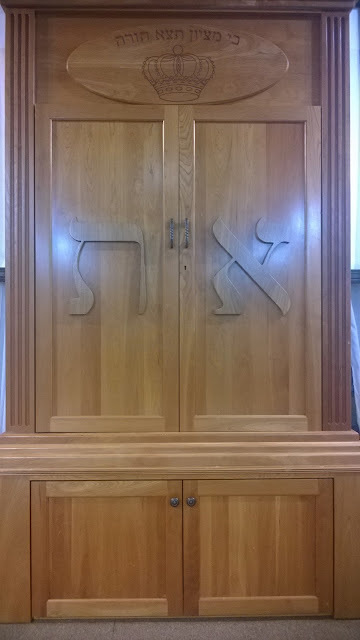 The doors have the Hebrew letters aleph and tav, symbolizing the first and last. "Ki m'tzion tetzeh Torah" - the Torah will go forth from Zion. The Torah going forth from Zion -- and into all nations -- is a reality today that didn't exist when Isaiah lived. Even in the time of the gospels, during Yeshua's lifetime, this wasn't a reality: the Torah and the word of the Lord was limited to the land of Israel and Israel's scattered. The Word of the Lord wasn't embraced by all nations. That has since changed. The fruit of Yeshua's arrival is billions of people from all nations, languages, races have come to the God of Israel through Israel's Messiah. Part of that is calling the Israel's Scriptures -- including the Torah -- as our inheritance. Not to take away from Israel, but to increase and enlarge. The engraving, then, is quite fitting. In the last 2000 years, the Torah has gone forth from Zion and the Word of the Lord from Jerusalem. And that, friends, is evidence of God at work. My thanks to Beth Immanuel congregation and the Hanke family for allowing us to inherit this beautiful piece.